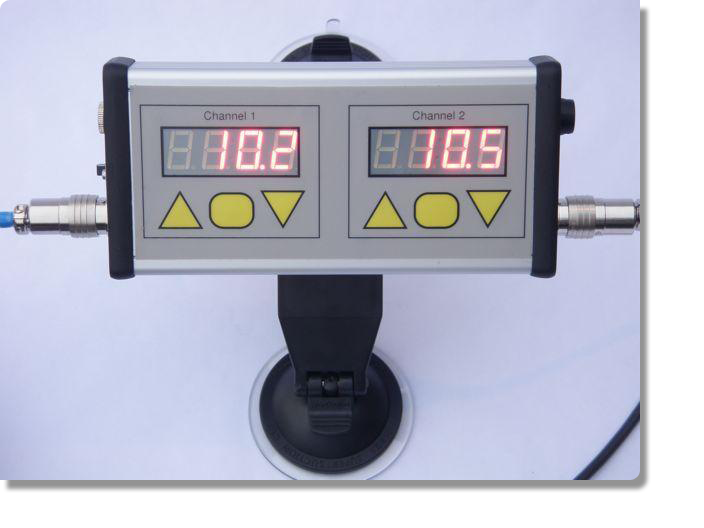 Twin channel fish transport vehicle dissolved oxygen monitoring unit, complete with 2 maintenance free galvanic dissolved oxygen probes. The DO1022 is designed for fish transport vehicles, and consists of a twin channel unit to monitor two separate tanks on the move. A clear, easy to read display unit mounts to the vehicle windscreen with the provided bracket (similar to a satellite navigation mounting bracket). The probe cables have a connection coupling, allowing the removal of the tanks and probes for cleaning whilst the remaining cable and display unit stays with the vehicle. If dissolved oxygen levels reach a lower preset limit, the display for that tank flashes to alert of the potential problem. The unit can also be automated to open an oxygen valve in the event of a low oxygen situation (see options). The unit is charged via a cigar lighter socket on the vehicle, however it does have it's own battery, so can also be used at the lake or stock pool to take spot samples. The DO 1022 caters for a two tank set up, however units can be tailored to suit, from a single tank up to 10 tanks. All of the units can be designed to automatically open an oxygen valve on the lines feeding the tanks. A lower threshold can be set, ensuring optimum dissolved oxygen levels are maintained, ensuring the well being of the fish. It is also possible to log the data, and provide a readout to the customer showing the fish have not been subjected to any undue stress.